"Ancient Kahuna did not call themselves Kahuna ... they didn't need to. Everyone knew who they were and they were known by the elders when they were born. The Kahuna went into hiding when it was forbidden to practice their spirituality and therefore when they walked amongst the people, no one addressed them to identify them. My ancestors have told me that it was now safe for the kahuna and indigenous shamans all over the world to share the wisdom and knowledge to those seeking it. People from across the globe have been seeking them out and by addressing myself as a Kahuna I am thereby making it easier for them to find me. My ancestors have told me it is time. I usually address myself as a Hawaiian Priestess. Many Hawaiians may not agree with me but I must trust the guidance of my ancestors. When I say I am Kahuna it is to honor these grand ones, the Ancients of my lineage who went before me to light the way. All that I have inside me comes from them ... I hope to make them proud for in this moment I am the reason they existed." Kahuna Wahine Ali'i Nui Kalei'iliahi Ka'ili-kapu-o-Lono is a kanaka maoli (aboriginal) of Hawai'i . She was born and raised in the lush Kalihi Valley on the island of O'ahu. Her ancestral roots trace 75 generations all the way back to the stars, to the Makali'i (the Pleiades), to Papa (Earth Mother) and Wakea (Sky Father) and down a long line of Kahuna Ali'i Wahine and Kahuna Ali'i Kane (Royal High Chief Priests and Royal High Chiefess Priestesses). Kahuna Kalei'iliahi's family God is Lono, God of Peace (also of Fertility, Abundance and Agriculture). Lono is uncle to Goddess Pele and she is their descendant. She is the reason for their existence and honors her 'Aumakua' (Ancestral Spirits) by using the multiple gifts they blessed her with, in service 'Io Kapu Nui (Most Sacred Creator) and to Humanity. Each year this Kahuna travels all over the world bringing the love and light and wisdom of the Ancients of Hawai'i through her workshops and sacred ceremonies.... touching others with their aloha. She is Ambassador to these grand ones and carries their royal blood. 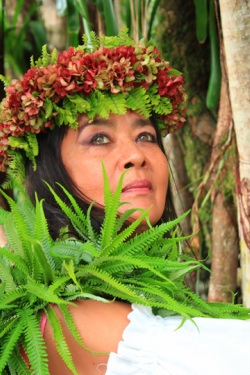 Kahuna Kalei'iliahi Ka'ili-kapu-o-Lono is a Spiritual Intuitive/Healer, a Wisdom Keeper, Visionary Artist, Keeper of the Lemurian Truths, a seer, medium, metaphysician, and channel for some of the most beautiful Holy Beings … to name some of the blessings she carries from her grand lineage. She has worked with people worldwide in these areas, helping these precious Humans to awaken to their divinity, to shine their light and heal their lives ... to become empowered and enlightened. Her specialty as a Spiritual Intuitive/Healer is clearing the blocks. After living in California for years, it was finally time to 'come home' to Hawai'i nei ... where she has returned to do her work. Kahuna Kalei'iliahi's ancestors come from the Kona and Puna districts of the Big Island of Hawaii where she now resides with her husband Lopaka. She is available for Spiritual Readings, to visit Sacred Sites and to share the ways of her people … bringing to you her deep aloha and sacred mana (Spiritual Power). 'Spirit has now placed upon you a high energy of responsibility, and one you have earned through your Akash. You carry the royal blood of a pure Lemurian, and one who has awakened to the core seed. Jeffrey Dunster and his partner had a vision that today has become the Hawaiian Legacy Hardwoods. When Jeffrey took me to see the over 2,000 acres of land to be restored with Koa trees, my heart soared to see the few remaining 'Warrior Trees' standing. It was this vision that was the inspiration for this commissioned piece. All the images in the drawing contain the heart and soul of a beautiful dream coming true for this land and for the people of this land we call Hawai'i Nei.